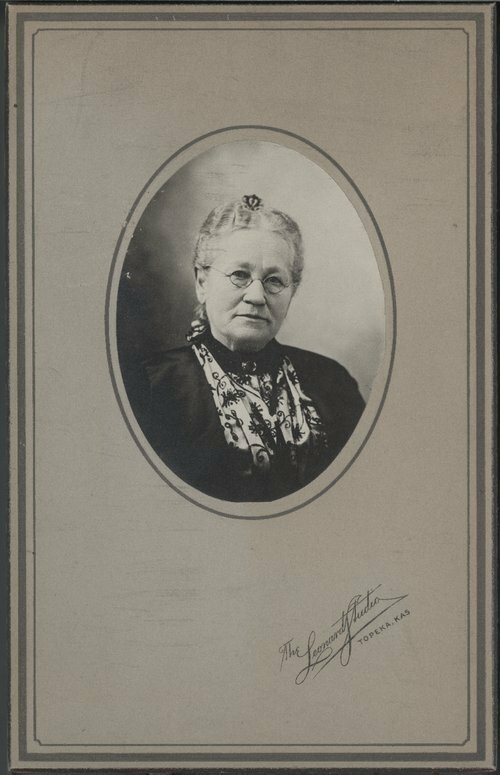 This cabinet card shows Katherine Amelia Whitney Whiting (1838-1907). Whiting a native of Waterbury, Vermont received her formal education at the Fairfax and Barrer Academies. She taught school in the Vermont area before marring Albe Burge Whiting on November 15, 1858. Within a year of their marriage the couple were moving to the Kansas territory. In August of 1859, the Whiting's settled near Fort Riley, and founded the town of Milford. For nearly twenty years the couple operated a number of business in the Milford area before moving, in 1877, to Topeka, Kansas. In the capitol city, Mr. Whiting engaged in a number of business ventures which gave him and his wife the means to give back to the community. As philanthropists the Whitings purchased in 1907 160 acres of land that established the Mt. Hope Cemetery in Topeka, as 1,000 year endowments for Washburn College, the Topeka Y.W.C.A. and the Topeka Y.M.C.A. Katherine Whitney Whiting died August 11, 1908 at her Topeka home at the age of 69. Burial was at Mt. Hope Cemetery.